Caroline Makes....: Baby Cow Gender Reveal Cake - For My Own Baby! There’s a big trend at the moment for gender reveal parties, in the US at least. I’m seeing more and more posts and pictures on the internet where couples expecting a baby reveal whether it’s a boy or a girl in front of their family and friends – often in quite creative ways. For instance, when the gender is discovered at the antenatal scan, rather than tell the parent(s), the sonographer places the result into a sealed envelope. The parents give the envelope to a bakery, which makes a cake that has either neutral or both pink and blue decorations on the outside, but the cake inside is dyed either pink or blue, and often has sweets in the centre that tumble out. It’s only when the couple actually cut into the cake and see what colour is inside that they find out whether they are having a boy or a girl. Another reveal method is for the couple or mum to stand surrounded by family and friends (usually outside) holding a large helium balloon that is opaque – often black or patterned. They burst the balloon and are showered with either pink or blue confetti – again having had no idea themselves what the gender would be. Those seem really fun if you want to make a thing of revealing the gender in front of your loved ones, but the idea of not knowing ourselves was a bit strange to me – and gender reveal parties aren’t really a thing in the UK. Nonetheless, I decided I wanted to make a gender reveal cake – but rather than give a sealed envelope to a bakery, my husband and I would find out at our 21-week scan and I’d bake a cake that evening. I wanted to fill the cake with sweets that would tumble out when it was cut, and I found getting hold of pink sweets was easy but blue surprisingly hard! As I was making the cake in the evening I wanted to have both colour sweets already to hand, so a few weeks before the scan started having a look on the internet and online in supermarkets. There are loads of pink sweets available, from strawberry bonbons to a giant tube of purely pink Smarties, but there didn’t seem to be a blue equivalent – at one point the closest I thought I was going to get was mint tic-tacs! Of course, I could have gone to M&M World in Leicester Square – where you can buy M&Ms by weight in any colour you like – and I do work in London but getting to Leicester Square is a bit of a pain and the shop is busy, full of tourists and generally not somewhere I want to go if I can help it. Luckily I spotted an old fashioned-style sweet shop called Hardy’s near my office – there are a few of these around. They had giant jars of all kinds of sweets against one wall, including pink strawberry bonbons and blue raspberry bonbons, so I bought a bag of each. I also wanted to plan the cake and buy the ingredients in advance – it might have been nice to have the option of baking both a pink strawberry cake and a blue raspberry-flavour cake but I decided to take the easy option and make a lemon cake. I used this recipe from Good to Know, though I didn’t do the lemon syrup due to lack of time, and realised the lemon curd in my fridge was out of date and I didn’t have time to make more, so I made a simple lemon buttercream for the filling. I made up the batter, adding lemon zest and a bit of lemon juice, and then added some gel food colouring before the mixture went into two cake pans. When it was baked and cooled, I used a glass to cut a circle out from both layers of cake, going right through the top layer and part way through the bottom layer. I spread lemon buttercream icing on the bottom layer and sandwiched the other cake on top, then filled the hole I’d cut with the sweets, replacing a thin slice of the disc I had removed so the cake would be flat on top. The rest of the buttercream went on the top and around the sides of the cake so I could cover it with a large piece of rolled white fondant. As my surname is Cowe – pronounced cow – this had to be a cow-print cake, like my wedding cake last year! But instead of black and white I made the patches a mixture of pink and blue. I used the same cutters from the Lakeland ‘make your own cookie cutter’ set that my sister and I used on the wedding cake last year – lovely to think that the cutters were coming out again for such a special reason! It was already 9pm and I was watching the Apprentice when I decided the cake did need a baby cow topper as well, so I moulded the animal – complete with baby bottle – while sitting in front of the TV. It’s not my best creation but given it wasn’t even going to be seen very long (I was taking the cake into work, not having a gender reveal party) I didn’t think it mattered much. I also made four alphabet blocks spelling ‘baby’- I thought the cake looked quite pretty and it didn’t actually take that long. So here’s what you’ve no doubt been waiting for…. 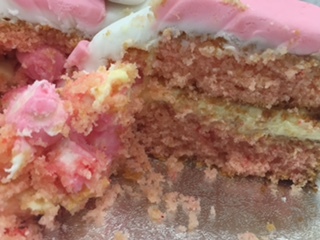 when the cake was cut the first slice revealed the colour inside was…. Pink! We are having a little girl. The cake tasted really nice and it was fun to see people’s reactions and to be able to share our news! I'm sharing this with CookBlogShare hosted by EasyPeasyFoodie. Congratulations Caroline! It's a cute cake and fun way to let your colleagues know the news. We didn't have reveals in my day, even from scans, so I'm not sure how I feel about knowing in advance, although I can see it helps with planning.